Benefits Of A 20x25x4 Air Filter Installed In Your Furnace? The 20x25x4 air filter is a favorite among both homeowners and HVAC specialists. 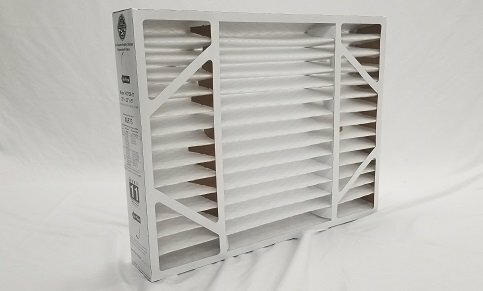 At four inches thick, the 20x25x4 air filter offers more surface area to capture additional particles, lasts longer and delivers a host of other advantages. Not every furnace will fit a 20x25x4 air filter. Some furnaces, particularly older furnaces, can only carry slimmer air filters. However, because 20x25x4 air filters do a better job at filtration, some homeowners choose to resize their furnace to fit these filters. If your furnace does not fit a 20x25x4 air filter, you can speak to you HVAC technicians about resizing your furnace filter chamber. The 20x25x4 air filter does a great job with filtration. It is able to capture and remove particles that stick to equipment and cause heating and air conditioning to slow. Typically, 20x25x4 air filters come with a MERV-11 rating. A MERV-11 rated filter captures at least 85 percent of particles sized 3.0 to 10.0 microns. One micron is one millionth of a meter. To put this in context, the average human hair has a diameter of about 50.0 microns. However, in order to experience the benefits that come with using 20x25x4 air filters, the heating and air conditioning must cycle regularly. Using a 20x25x4 air filter also improves your heating and air conditioning. When homeowners regularly use a clean 20x25x4 air filter, they protect not only their home air but also their heating and air conditioning equipment. Particles and pathogens that make it past the air filter stick to sensitive and vital parts. Wires, motors and fans grow sticky and thick with buildup. This creates resistance that causes expensive repairs and permanent damages. Buildup reduces energy efficiency and indoor air quality. It also shortens the lifespan of your central air system. On the other hand, with a clean 20x25x4 air filter homeowners stop more particles from entering the furnace. In doing so, parts last longer and work better. By keeping the furnace clean, homeowners also keep their home air clean. The 20x25x4 air filter is a bigger furnace than other furnace filters. At four inches thick, it offers greater surface area to capture more particles and germs from airflow. It works better and it lasts longer than other cheaper disposable air filters. As a result, homeowners do not need to change 20x25x4 air filters as often. Fortunately, most 20x25x4 air filters last between six to eight months. By that calculation, the average homeowners will not need more than two 20x25x4 air filters in any given year. In contrast, a one-inch air filter will need to be changed every two to three months. No matter how great your 20x25x4 air filters are, they still must be changed on a regular basis. In addition, they do not solely protect your furnace and air conditioner from damages and repairs. HVAC maintenance is an exceptional way to protect your home, home air and equipment. With HVAC maintenance homeowners prevent up to 90 percent of all expensive repairs and permanent damages. During HVAC maintenance, your specialists come prepared with a set of precision tools to deep-clean and service sensitive pieces of the furnace and air conditioner. They run comprehensive evaluations and tests to ensure that the entire central air is healthy, clean, safe and efficient. Heating and air conditioning specialists recommend HVAC maintenance at least twice a year on top of regularly changing out dirty 20x25x4 air filters. Homeowners who follow this advice have superior home comfort, the best HVAC and peace of mind. Service Champions HVAC specialists know all there is to air filters. Depending on a number of factors, the right air filter for you may be different from that of your neighbor. To learn if the 20x25x4 air filter is right for your home, consult our expert technicians. Service Champions Heating & Air Conditioning is the Diamond Certified HVAC provider for Orange and Los Angeles Counties. We lead in air conditioning and heating installations, repairs, maintenance and advanced air care solutions. Our experts always combine superior technical care with genuine customer service. Both you and your home receive top care. To learn more about 20x25x4 air filters and indoor air quality from the trusted experts, complete the form below. You can also speak to our friendly call center representatives for more information.